In science class we learned that "Every action gets a reaction." In consciousness research we learn that many prayers have a field and many thoughts and prayers have a field-effect. 1. A positive ordering-effect that performs as a healing-effect on the organisms whose norms were deviated from a normal range. An ordering-effect tightens up the order of an organism. 2. A goal-directed-effect that pushed organisms around with no reference to aligning with order and norms or a normal range. With exceptions, a goal-directed-effect deviates from the order that defines an organism. 3. Sometimes a goal-directed-effect became a negative dis-ordering-effect. 4. There was an accumulation of various effects recorded in a test to be sorted out. 5. There were no effects recorded from the efforts of some volunteers. The research sought effects that moved an organism around. Preferably the effects sought were ordering-effects that moved an organism toward order. How is the word order applied in the tests? Spindrift identifies order as the arrangement of components that enables an organism to best achieve its intended purpose. What was observed? Spindrift looked at a deviation away from order that would reverse direction. Reverse direction means the organism prayed-for began to move back in the direction of its inherent pattern of order and norms. Control groups were also observed. The following are examples of how the prayer sequences worked in the lab. The methodology and analysis of the experiments below and other experiments can be found in The Spindrift Papers, published in 1993, 396 pages. For book inquiries, the Papers can be found on the Documents page here. Page XV of The Spindrift Papers covers the steps taken by the co-founders of Spindrift to have some of the prayer experiments and data published in peer-reviewed journals. The accumulation of effects on the X, Y, Z Soybean Experiment. This first soybean test studied the quantity effect of prayers given. The study of the effects of the quantity of prayers given is different than the study of the effects of the quality of the prayers given. This X, Y, Z test involved one person's thought being the input for the quantity of effects that could be counted without having a group of people praying to produce the quantity of effects to be counted. What was the input to this test? There were single and double treatments of prayer conveyed to the soybeans. A single treatment means a prayer was given once a day. A double treament means a prayer was given twice a day. The beans designated as letter Y got the double treatment of prayer. How were soybeans divided and counted? Soybeans subjected to stress were divided into four groups: control, X, Y, and Z. The X and Y beans were prayer treated together once daily; the Y and Z beans were also treated together once daily, the Y beans thereby received a double treatment each day. The X, Y, Z experiment suggests that, with one person praying, the double treatment or additional quantity of prayer produced increased results. Group prayer can have a quantity of intention effect too, but one person praying can have an effect that sometimes can be singled out. Perhaps the accumulated results from the quantity of thoughts on these beans suggest that the more that positive prayer imprints a situation, the more evidence of an imprint. Unfortunately, the reverse may also be true: the more wrong-motivated or negative or dark thoughts and prayers are on a situation, the more evidence of an imprint, a harmful imprint. A group could pray together and produce a good effect or a harmful effect. X, Y, Z is a test of the quantity of thought, not the quality of thought. The volunteers' results varied from successful outcomes (as with this example) to unsuccessful outcomes that showed no additional growth. The X, Y, Z test suggests that quantities of thoughts and prayers on an organism have an accumulative outcome. In other tests involving the quality of thought, quality was found to often smooth out the high build-up of effects occasioned by the quantity of thought on an organism when there was a need for the smoothing-effect. That is, quantity and quality are often opposed on what they are designed to do. Quantity often pushes for a big effect. For example, some faith healing pushes for a ramped-up healing-effect to manifest. Faith healing is often a quantity of focused healing-effects. In contrast, quality adjusts the healing-effects for what is a proper fit for the organism. An effective quality thought or prayer can potentially temper quantity when quantity tries to overwhelm and replace a quality outcome. Spindrift did some study of group prayer, which means more than one person praying. The quantity of accumulated collective effects were observed. Jesus' instruction about "two or three gathered in my name" has a strong effect suggests that multiple thought-forces create a piggyback effect. The piggyback effect means that the count of the quantity of prayers produce a bigger difference on the results. What happened in this test? The soybeans moved in the correct direction or not of water relief or of water retention. This two directional soybean experiment pursues the question of whether a goal-directed prayer or a non goal-directed prayer is in operation on two groups of soybeans. The bi-directions elicited by these two prayer types registered the effects of the quantity and quality of the empathetic thoughts of the prayers. The Spindrift bias was that the effects from non goal-directed prayer would move the soybeans closer to the order that met the needs of the beans better than would the effects from goal-directed prayer. Many of the Spindrift experiments found that the quality in non goal-directed prayer moves and mends organisms in the directions that are best for them. The quantity of thought in goal-directed prayer was found to move but not mend organisms in the directions that helped them. In this test of prayer, quality and quantity were not being measured for how much effect they have on the growth of soybean sprouts. This test measured how the quality of thought addressed the moisture needs of the soybeans. The test involved the effects of prayer on the early stages of the soybeans' growing conditions: if the beans' moisture amounts were improved or not improved. How were the two soybean groups tested? Both groups of beans were prayed for at the same time. One group was over-soaked soybeans. The other group was under-soaked soybeans. Thus, both groups of beans were deviated from a normal amount of moisture retention for them. Quantity as in quantifiable enters into the test in the measurement of water retention. It was previously known how well beans thrived in different water weights. In this test, bi-directional effects were sought that had a relationship to the "needs" of the beans. A bi-directional mending-effect was hypothesized to move in the direction of the "norms" of the soybeans. What does bi-directional mean? Depending on the need for more moisture for the beans (one direction of a healing-effect) or the need for a reduction of moistness for the beans (a second direction of a healing-effect), the normalizing effects took place for the two soybean groups or not. Vounteers were asked to pray for the two groups of soybeans side by side. Most of the vounteers did not know which of the two soybean groups in bags was in need of more moisture or less moisture. There was also a control group with the same moisture makeup of soybeans. The control group was out of the line of sight of the people praying and the technicians running the tests as best as possible. Nothing we know of can entirely shield an individual's thought from incoming thoughts in the mental world, but this was a "blind" test in that most participants were unaware of the needs of which beans. The hypothesis was that the nonlocal intelligence of the ordering-force was "norm directed" and would know the respective needs of the soybeans apart from what the people praying knew about the needs. Lessons were learned from experiences and experiments with both goal-directed prayer (asking for something specific to happen) and non goal-directed prayer (let what is best happen). It was learned that prayers tend to move in different directions depending on which prayer type was dominate in the mind of the healer. For Spindrift's purposes, the prayers tested affirmed these two effects for the beans. Though many prayer providers did not know the specific need to pray about, their prayers were applied to the two soybean groups. As results came in, they matched the hypothesis. With non goal-directed prayer, the group of over-soaked beans gave off water and moved down toward normal, and the under-soaked beans took on water and moved up toward normal. The different needs were met. In comparison, the effects of goal-directed prayer pushed around the condition of the soybeans without regard to adjusting to the norms and needs of the beans. That is, the quantity effect of goal-directed thought pushed aside quality healing-effects. Instead goal-directed thought foisted its effects on the beans which didn't improve the condition of the beans. Some volunteers did not affect the beans with their prayers. Their results looked similiar to the control group of soybeans. The control group of beans was either unaffected by the surrounding presence of prayer or sometimes the control group beans moved slightly in a direction. For the control group, the slow movement in a direction of less or more moisture was probably due to the spillover effect from entanglement of human thoughts Associationally Linked with plants in the laboratory. The operation of need-directed prayer, which is non goal-directed prayer, was quantified by moisture weight in the move toward normalcy for the two groups of soybeans. When prayer had a goal, which amounted to a prayer telling the two sets of beans what to do, the moisture results had no relationship to what the beans needed. Prayer with a goal or plan tended to move the soybeans' moisture weights around without a fix on a normalcy-referencing direction toward the norms needed to be achieved to indicate a center point of normal water retention. In summary, non goal-directed results showed two separate directions of psychic action occurring in the same time frame. That is, the prayer-effects on beans were bifurcated in two directions. When non goal-directed prayer was operating, the patient or target receiving the healing-information was drawn toward a normal range. If the need was for less or more moistness, the two seed groups' different needs improved and moved toward center or normal from no goal in the mind other than to affirm and love what was best for the soybeans. Random numbers are pursued by prayer in these experiments of psi. What is meant by the word order? Spindrift identifies order as the arrangement of components that enables an organism to best achieve its intended purpose. Bruce and John Klingbeil helped pioneer computer generated random numbers as valid test subjects. Aside from computer gadgets getting smaller, modern society tends to give credence to the big glitzy things that hit one in the face, not smaller things. To establish that small amounts of psychic activity are going on when tracking random numbers, Bruce and John strengthened the truth of the adage that "Little things can make a big difference, too." Bruce and John picked up on the work in parapsychology that involved chaos theory and analyzing the subtle effects of thought on objects such as the random guessing of cards and tossing dice. When the personal computer began to take root with the public in the 1970s, Bruce and John saw the computer as a new tool for tracking the effects of thought and prayer. In 1977, the Klingbeils bought one of the early Apple II computers and inserted a random number generator board. The random number board produced an acceptable level of random numbers as random zeros and ones. With no thought applied, when the binary numbers accumulated, the numbers were around 50-52% as tilting either a few more zeros or a few more ones beyond the considered average of 50%. What happened with prayer and psychic activity in the vicinity? In the same room with other lab tests of thought and prayer, the sensitive random board overtime started to exhibit patterns of zeros or ones that were not random, instead went beyond 52%. When various experiments were performed directly toward the board itself, a more pronounced effect of thought imprinted the random processes. Zeros or ones were being shifted into patterns in the 60% range and on some occasions the board produced numbers in the 70% range. The prayerful mental associational linkages to the board built up with use and diminished with disuse. What was going on? There appeared to be two effects. The effect of thought on the random board showed evidence that patterns of zeros and ones were no longer random. What about the random board itself sending out random numbers? The Spindrift participants sometimes prayed for the electronic oscillator that generatated the random numbers. The oscillator was treated as a patient. That is, the oscillator circuit was conceived of as an identity. Just as living organisms have norms that define their identities, would a random generator have norms that define its identity? Yes. What is the intended order produced by the identity of a random number board? To better define its purpose, a random generator would presumably approach truer randomness to "be all that you can be" as the Army slogan goes. Since the generator in the Apple Computer produced "acceptable" randomness--not true randomness but semi-randomness--there was a potential opening for improvement and growth for the organism. Prayer was found to help the random generator produce a truer pattern of randomness, for randomness is a generator's purpose and identity. A healing-change is a shift toward more order. In a twist of logic, a shift for the random board to produce better randomness was a healing-change toward more order for a board since a board's purpose and identity was to produce randomness. The improved random pattern was a measurable dimension of its identity. A deviation from the intended order of a random board would be a deviation from its ideal functioning. Thus, a movement toward more order would be increased randomness. Of course, we think of human and plant identity and functioning in an opposite way where order is logically more straightforward. Spindrift gradually owned four random number generators or RNGs. The Klingbeils' application of mathematics to draw and array zeros and ones from an RNG generator indicated changes going on within the randomness. A control group RNG board ran comparison numbers that stayed around the mean of 50% to 52%. Researchers that test the quantity of thought on randomness have done remarkable work, for their results demonstrate that persistent psychic thoughts bring subtle shifts toward order inside randomness. These quantity of psychic thought experiments hint that more doses of thought build up more of an effect. The effect is a non-random pattern where a random pattern existed before. Most researchers look for random number experiments to show what the quantity of psychic thoughts are doing to random numbers. Researchers are looking for a change from a random pattern to a non-random pattern. Spindrift has been asked, "What about the quality of doses of prayer?" The quality of thought was in evidence when prayer affirmed the purpose of the identity of the random board was to potentially become more random. The effects of quality often coincide with the persistent quantity of prayer, too. For example, people sometimes ask for more prayer when they desire to better reach their potential or do better on an exam or to get through a stressful situation or an athlete may desire to engage a better than usual peak performance potential from himself. So too, a psychically sensitive RNG that is encouraged to be better could perform at a higher peak level by engaging a dimension of its identity to express more of its potential purpose to produce purer randomness. From several Spindrift tests, prayer that was identity-referenced was found to help an identity grow out and show some of its potential purpose for the organism the identity supported. Generally speaking, before a person begins to pray for a pattern, person, or plant he should gain a sense of the purpose of the patient receiving the prayer. Focusing prayer on the purpose of an identity helps the patient grow more attuned to his identity's purpose, so he can expand his potential on what he is created to do. Random number generator experiments have come a long way since the 1970s. In the Twenty-first Century, researchers around the planet are running RNG experiments 24/7. Many random number generators are sensing concentrated thoughts and collecting them from mankind. When large concentrations of thought are focused on the same events such as the Super Bowl, the Oscars, and 9/11, blips of non-random patterns are recorded. These continuing RNG experiments are providing an impressive array of data that adds to the argument that psychic effects do occur in our world. For example, see the RNG Global Consciousness Project. The hypothesis about randomness being affected by thought and prayer is explained in The Spindrift Papers, 1993, section 3-1. Noted in A Journey Into Prayer: Pioneers of Prayer in the Laboratory, pages 62 - 63 and 334 - 337. The concept of purpose is discussed in Journey on pages 345 - 350. Here is some additional information about praying to clarify the purpose of an identity behind an organism. The Clarification of purpose is the effect of non goal-directed prayer. The Klingbeils thought of knowing an identity better as information gathering that improved the healing-element in prayer. The improvement is that healing-prayer affirms what attunes closest to the truth about an identity and its purpose. Knowing better the true identity in back of an organism reinforces knowing the true purpose for the identity. Wave prayer, also known as non goal-directed prayer, supports what is truest about an identity and its purpose. Wave prayer references the truest innate identity. Otherwise, through particle prayer, the mind tends to impose its own views of culture and goals of identity on an organism. Wave prayer and particle prayer are defined as quantum prayer on the Theory page and Question 1 of the FAQ page here. About the purpose of any identity, which includes AI or intelligent machines yet to be invented, plant life forms to emerge, changes in DNA, clones and hybrids of people. The norm points of any organism define the inherit order of that organism. These norm points suggest that an organism has an ordered purpose. Can we detect an inner potential purpose of an identity that provides definitions for the organism? If we observe a wheat plant strangled by weeds or the plant is infested with bugs or it's depleted of water, we know the wheat plant isn't growing into its potential or purpose. We know better. In contrast, if we see a man as an ordered biological blob, we project on his identity the potential purpose of pretty much "the survival of the fittest." We miss other information about man's spiritual potential. If we expand a man's identity as ordered by the spiritual image of God, then that man has more leeway to grow into his potential of a larger quality purpose than just existing as a Darwinian man of survival. A Spindrift Press Release published in A Journey Into Prayer page 106 refers to Bruce and John Klingbeil sorting through many effects to determine how the effects line up with the causes of the effects. A comparison is made to inventor Thomas Edison going through hundreds of materials to find the filament that worked best for the light bulb. Most of us have heard of people who are receptive or unreceptive, flexible or inflexible, bending or unbending. How might that observation of people translate into how thought and prayer affect material objects? A strange word in consciousness research is labile. The word labile is a state of matter that is somewhat not fixed or automatic. Apparently some material substances are more sensitive to thought and prayer than other substances. Why is that? Probably because some materials are slightly unstable and can be pushed around or shifted a bit. They exhibit lability. Similar to Thomas Edison, Bruce and John tried many types of seeds, plants, and some electronics to find which ones were sensitive enough to report back effects addressed by thought and prayer. There were organic and inorganic examples found of "labile." For example, yeast was found sensitive to thought and prayer, but it might also relate to there being some genes in yeast that are also found in human beings. Another object found to be labile was an electronic random number generator. Spindrift predicts that some material mechanisms should be found that give a response to the stimulus given by thought and prayer. For example, some musicians are convinced that their instruments relate to them personally. The instruments respond that the owners are playing the instrument versus a stranger. As I wrote to a musician friend "I am sure you would instinctively feel that there are rare times when more is going on than meets the 'ear' and what is fixed about an instrument." Taken further, some sensitive sound equipment should elicit more performance if the sound mechanism bends to the musical ear of the listener. There is already a possibility that some sharp-eyed machines might be able to read a silent request in the human mind and perform the task. The Spindrift Tests, by John Klingbeil, 1983, 136 pages, page 96. What was the task of the test? The healing task was to benefit the yeast. Test participants were given the task of praying for stressed yeast. Participants knew the yeast needed some help. Most participants didn't know what would be a beneficial result for the yeast. The effects of the participant's thoughts and prayers fall into three categories. Goal-directed effects are in green. 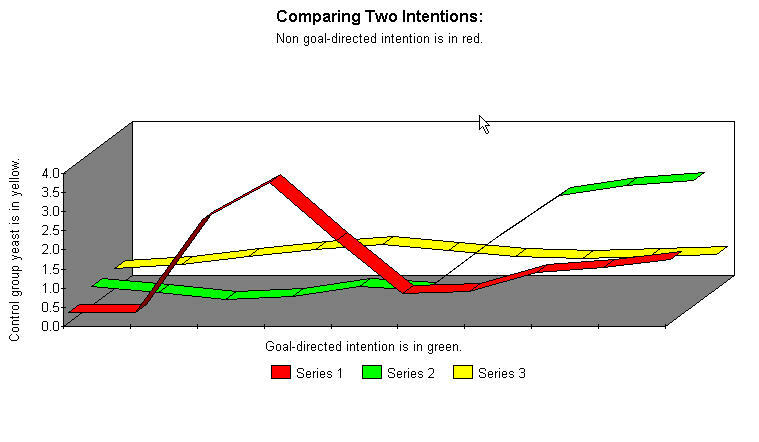 Non goal-directed effects are in red. Control group effects are in yellow. The control group yellow means that no outside effects manifested. No thought or prayer was applied to the control container of yeast. Some volunteers didn't register a detected effect on the yeast container they prayed-for. Their flat results looked the same as a control group result. Volunteers whose prayers were often experimentally effective sometimes occasioned flat results that didn't register effects. These flat results looked similiar to a control group result. All flat results were added into a volunteer's accumulated results that included their effective goal and non goal-directed prayer results or however from their backgrounds they prayerfully addressed the yeast. What does the graph below mean? The x-axis (horizontal) is a time frame of 40 minutes. The y-axis (vertical) measures from 0 to 4 grams, in one-tenth grams, the weight loss of gas the yeast gives off during a 40 minute test. In the test below what was closest to natural, normal and best for the yeast was a peak response of gas release in the first 20 minutes of the 40 minute time frame. The closest response to normal was produced by non goal-directed thought. The most complete Spindrift book which includes experiments, theories, and data is The Spindrift Papers by John and Bruce Klingbeil, 1993, 396 pages, privately published. Mung bean tests had seven containers (a control, 1, 2, 3, 4, 5, 6). A die was shaken in a closed box with the face up that tagged the target, the unknown container. By treating the container indicated by the upturned and unknown die and then by selecting the container with the most sprouts, one could tell the number of the upturned die. From extensive preliminary tests it appears that the percentage of increase of treated over control is reduced by about 50% because of the indirect treatment to the hidden target of the prayer. Direct treatments to known targets and indirect treatments to hidden targets occur through associations of the mind or entanglement which Spindrift calls Associational Linkage. Read more about Associational Linkages made by the mind that form linkages to targets here. Indirect targets are understood as unseen targets. Spindrift also discusses what is called indirect prayer. Indirect prayer knows that it's praying for something out there, but that something is vague and not clearcut in the mind of the person praying. See the Theory page under indirect prayer for more discussion about the scattering of effects from not getting a decent fix on a target. What follows is a speculation. Why would looking with the eyes and ears at a target elicit a stronger effect than not looking directly at a target? By looking at a target and tagging it with thought may be related to the biophotons that emanate from a person praying. Not too much is known about this biological phenomenon, but biophotons are a fact and human beings subtly transmit these signals and receive them, too. Perhaps biophotons are essential with connecting tissues of thoughts with other people and things. Psychopaths could be lacking biophotons or are blocking biophotons coming in that may be necessary for feeling empathy. In the Spindrift literature are a number of tests about how our own subconscious minds work against us human beings to recognize for long psychic and spiritual experiences of our own or that we witness. However, a few people are able to remember a vivid experience and hang on to it. After awhile, the experiences they relate to others turn into a glowing story to the point of reaching fiction. Additionally, the more dramatic psychic experiences and spiritual healings tend to happen in situations where the experiences cannot be tied to verification by researchers. The skeptics say, and rightly so, "You can't prove what happened were actual psychic experiences." The Klingbeils' proposed that Defense Mechanisms often manipulate the mind in such a way that men and women don't know for sure if they experienced or what they experienced about the paranormal. See the table of contents of Bruce and John Klingbeils' book, The Spindrift Papers, for the Defense Mechanism tests and theory. The Spindrift Researchers sought ways to experimentally show that the Defense Mechanisms of the subconscious mind produce alternate ways to explain, cover-up, and dismiss psychic experiences and spiritual healings. The Klingbeils' hypothesis is that in the human mind exists a psychic sensitive Defense Mechanism. * That is, a deliberate effort is made by Defense Mechanisms to undermind what transpires during psychic and spiritual experiences. One reason is, the Defense Mechanisms try to nudge, prod, and stimulate people to stay on a life path that is healthier for them than to get sidetracked into risky or bizarre psychic and religious activities that divert from living normal lives. Is there a spill-over to researchers doing experiments? Science may find that many kinds of psychic tests are not yeilding exact information as more is understood of the strangeness of the subjective nature of quantum influences. In a related way or not, researchers are constantly going from successful tests to complete failures when a replication is tried. A preliminary experiment shows promise. Then looked at more closely, the experiment becomes foggy and confused. It's kind of like walking in a dream and getting nowhere. The Klingbeils believed that if it could be scientifically shown that there are genuine psychic and spiritual experiences, a floodgate would be opened for bizarre psychic phenomena entering the world. The Defense Mechanisms and the skeptics fear the world would now fall into ignorance, fanatical beliefs, and anti-reason. In some cases, what the founders of Spindrift felt happens with failures is, when a fresh idea is tried, it hasn't yet set-up a detectable pattern to be countered by the Defense Mechanisms. So psychic effects and healings flow. When too many people notice that perhaps there is something of a pattern of reality about psychic and spiritual forces, then the Defense Mechanisms take notice and begin their sabotage through their Law of Distraction that undoes the evidence for psychic and spiritual effects being real phenomena. Laboratory tests that once showed promise stop working. Psychic intuitions begin to make the one experiencing them look foolish and make mistakes. A person with a record of experiencing spiritual healing, if drawing too much attention to himself, will find healing coming slower or stopped altogether. Scientists and skeptics should comment that the inconsistency and disappearance of results suggest that nothing was there or it's a fleeting effect or the hypothesis is looking for the wrong effect. Why would our own Defense Mechanisms divert us from vividly remembering accurate information about psychic experiences and spiritual healings? There might be psychological and sociological reasons for blocking clearcut paranormal experiences from being completely recognized by human beings. Too much woo-woo in a person's life brings disruption, suspicion, and a drawing away from the present realities of life. The fear of the Defense Mechanisms is that consistently experiencing the paranormal results in people living on the fringe of society. People who dwell too much on a psychic, UFO, or religious experience could potentially send themselves to the boundary of sanity. Some people who see psychic activity around them or repeat and loop over and over about a past psychic experience or a spiritual healing get so wrapped up those experiences that they forget to do normal living habits such as taking care of their health and providing for their families. The Defense Mechanisms allow for some novelty in life, but chiefly they work to keep us human beings at a safe distance from perceived dangers. Dwelling too much on paranormal, UFO, and religious experiences are anticipated to be dangerous distracters from maintaining safety and doing the normal routines of life. For those who are conspiracy minded, the Defense Mechanisms may have dark motives, too. The conspiracy may be to not permit men and women from discovering their spiritual natures and psychic abilities. Why? In order to keep people locked on a level where they can be controlled by mesmerism to not be allowed to perceive any kind of reality beyond what the physical senses project as reality like in the movie the Matrix. The psychic psychological Defense Mechanism Theory is explained in depth on the Theory page, Theory 9 and on the FAQ page, Question 3. * Source: The Spindrift Papers, 1993, by John and Bruce Klingbeil, sections 4-1 and 5-1. In 1989, for a Sacramento, California USPA conference on consciousness, the Klingbeils wrote a scientific paper to explain the concept titled Cards, Dice, and Defense Mechanisms. What might be some areas of psi research in the future? Random numbers forming into patterns and remote viewing revealing distant objects. Random numbers affected by consciousness experiments and remote viewing experiments might become choice areas of psychic research. Remote viewing requires less repetitions of a test and has produced some startling findings. Another name for healing at a distance is remote healing. Spindrift proposes that the Quality of thoughts involved should be researched as well. The Klingbeils did some tests of thought on bacteria. They also conceived of a test of a DNA molecule to see if prayer could affect it. (A Journey into Prayer, page 186.) Among the Spindrift staff discussions was the idea of testing prayer on an AIDS virus isolated in a test tube. (Ibid., page 186.) John did some electronic biofeedback tests to see how different states of thought could affect a healing outcome. (Ibid., page 78.) Remote viewing a target that was prayed-for was tested on unseen seeds in containers at a distance. (Ibid., page 187.) Like with several experiments, remote viewing held promise, but was a division of too much time from thorough and repeated experiments of prayer on other organisms. Bruce, John, and Deborah Klingbeil had some success praying for animals. They had contact with a family in the Republic of Haiti. The family owned a goat and a cow. Their animals were producing the normal amount of milk for the family. However, the animals weren't producing enough milk to meet the needs of the family. Prayers by the Klingbeils for the needs of the family had an unusual effect on the normal cow and goat. In line with non goal-directed prayer that aligns with what is best or nearest best for the circumstances. The circumstances in Haiti apparently signaled that more milk was needed than was normal. The goat and cow began to produce more milk than was considered normal for the animals to produce. No extra stress and strain was noticed on the animals. The family was grateful to have one less daily problem. The following are other experiments that Bruce, John, and Deborah tried with some degrees of success. In Wisconsin, John and Deborah prayed for some cows and a few horses that were diseased and marked for execution. Most of the cows and horses were healed. One time, Bruce Klingbeil happily reported to Bill Sweet that he and John had prayerfully supported Deborah's purchase of eight diseased cows and the cows were healed. Not one failure in the eight cows. Bill Sweet heard that the horses returned to their owners. The unfortunate outcome of these prayer successes was, the cows were sold for slaughter. A farmer in Wisconsin asked John Klingbeil to pray for a sick cow. Of course, the farmer didn't want to lose the cow because of his investment. The cow became noticeably better. A farm veterinarian arrived at the farm and tested the cow. He confirmed the cow was healed. Three fields of soybeans and at another time three fields of cranberries were prayed-for and then later tested to measure crop production. Field number one was designated a control group field that was not prayed-for. Deborah Klingbeil brought in a group of Baptists from a local church to pray goal-directed prayers for the second field of crops. Some of the Baptists marched through the field praying. The third field received non goal-directed prayers from Deborah and her prayer friends. The results showed that the control group field had some production but was full of weeds. The other two fields displayed less weeds and produced a good level of production, but there was no difference in the quantity of crop production from each of the two prayed-for fields. What was different between the two fields of crops? The field that received non goal-directed prayers had healthier seeds for the next year of planting and the ground soil was fertilized with more living organisms. With non goal-directed prayers, that loved the identities of the third field and its seeds as a whole system, there was a qualitative difference but not a quantitative difference. It was a thrill for the people involved to record the comparison of a goal-referenced field and an identity-referenced field. How are a whole field of a farmer's crops or thousands of seeds in a lab prayed-for as one group? On the Founder's page of this website, search for the words conceptual whole, and read about the Klingbeils' Law of the Conceptual Whole (Field). The law of wholeness about praying for many targets as one unit is also explained on the Links page and the Theory page. The wholeness law is also mentioned on page 179 of A Journey into Prayer. There was an author and water experimenter from Japan, Dr. Masaru Emoto, who showed what positive and negative intentions of directed thought did to water crystals. It was hard for other laboratories to replicate his findings. Like with all paranormal effects, they don't pop-up 100% of time. Paranormal effects should be considered interesting when they happen beyond chance happening. Spindrift's Deborah Klingbeil did an experiment involving water. Two containers were filled with dirty water from a river. A chemical pill was dropped in each container. The water turned shades of blue that indicated how poorly oxygen was able to transfer in and out of the water. After a week to two weeks, pills were dropped-in again. The control group container of water was still dirty and didn't move oxygen well. The container of river water that was prayed-for was still dark with some dirt, but it delivered oxygen freely. Prayer provided a qualitative difference for the water. This visual experiment made an emotional impression on those volunteers who participated. A minister had Deborah set-up a mini-lab in her basement. There was one occasion, after praying for the yeast test and then forgetting about the test for a week. The minister went downstairs and smelled fresh yeast and didn't click what had happened. Seeing the bubbling yeast that had been prayed-for, the minister thought to toss it out, then realized that prayer for the yeast a week earlier had worked on it to the degree that it was bubbling a week later. The control group of yeast was doing no bubbling. It's understandable that some people can get excited about visual presentations of thought and prayer working on modest experiments. The future may have many such examples of prayer in the science laboratory taken out of the lab and applied to the laboratory of life. Can you give an example of an unintentional wrong motive for a prayer? The following incident happened to Deborah Klingbeil. Deborah worked in animal hospital that had a water tank that included octopods. One octopus became sick and developed a high fever. Deborah prayed a goal-directed prayer to reduce the fever for the poor octopus. A veterinarian happened to mention that the high fever was necessary for the healing process. The fever was burning off bacteria. Deborah realized she was praying incorrectly for the octopus. Her prayers to reduce the fever were acting against what was in the best interest of the octopus. She switched to a "'Thy will be done” approach. When the octopus recovered, there was a personality change. Before the fever, the octopus stayed by its self. Now when Deborah approached the water tank, the octopus came nearer the glass and was friendlier. In the August 13th. 2015 science journal Nature, a science article argued that octopuses are 100% different in their DNA than other living organisms on planet Earth. The Nature article presents the case that octopuses are not of our world. Octopuses are outer space aliens. For UFO fans, perhaps we have been visited by aliens as octopi. For prayer fans, apparently prayer works for aliens from outer space, at least those aliens in the form of an octopus. "I just surrounded that beaker of yeast with love and knew God's Love would reach them." "I wanted the beans to get better." "I addressed the grass seeds to grow into their full identity." "Thinking about the many seeds as one, I prayed for the completeness and wholeness of all the organisms as one. "* "I talked to the plants and willed them to shape-up and get right." "I thought I would guide the yeast cells to become normal." "I prayed for normalcy." "The power of the Holy Spirit is here, working in this room, in these plants and organisms. Thank you God for the presence of Jesus Christ and the power of the Holy Spirit. So it is. Amen." "I prayed that my intention was to prod and push the seeds in the direction I thought was the right direction for healing them." "My wish in prayer was for the highest purpose of the organism to manifest." "I affirm that the Truth of God and the God of Truth is in this house, in this room, in me, and in the true identity of the subject that was given the attention by my prayer." "Sometimes I ponder Mrs. Eddy's sentence 'Truth is affirmative, and confers harmony.'" "When in prayer, I focus on what is true and exclude what isn't true." "I reflect upon the thoughts that God has for me as His child. Then I acknowledge those thoughts are also true for the object of my prayer." "I praise God for His perfect creations." "May the Truth of true identity prevail over resistance." "I humbly pray to be worthy of expressing divine healing-Love to a patient as a plant." "A warmth came over me. I conveyed that warmth, that love, to the object of my prayers. Let it be the love and prayer for the sprouting beans, huddled yeast cells, or patches of grass seeds or other seeds." * This prayer is linked to the Law of the Conceptual Whole, on the Theory page. The methodology and analysis of the above and other experiments can be found in The Spindrift Papers, published in 1993, 396 pages. For book inquiries, the Klingbeils' book, The Spindrift Papers, is found on the Documents page here. Page XV of The Spindrift Papers covers the steps taken by the co-founders of Spindrift to have some of the prayer experiments and data published in peer-reviewed journals.